A new study conducted by BrandSoftech.com reveals new insights into the traffic distribution of the various positions on Google’s search engine result pages for the gambling industry. BrandSoftech.com is a leader in marketing for the online gaming industry and with this new study, they hope to be able to help online gambling companies gauge more accurately resource allocation based on expected return on investment when budgeting for SEO services. Currently, only two sets of data exist as to traffic distribution by position. One set of data came from a 2006 incident where AOL accidentally leaked over 30 million search queries from over 600,000 AOL search users. This allowed internet marketing companies to determine that for AOL searches, the sites that came up under the #1 position receive an average of 42% of all search traffic. The other set of data was released from a 2004 Cornell University eye tracking experiment conducted by Laura A. Granka. This experiment, with 46 participants, concluded that the sites that come up #1 receive on average of 56% of all search traffic. This data has been used by countless online marketing companies in their efforts to find appropriate budget allocation and expected return on investment. Unfortunately, no such data existed specifically for the online gambling market, which meant gambling companies were relying on data that was heavily skewed by other industry averages. New software developed by BrandSoftech allowed them to track and create statistics based on over 63 gambling sites, which received 5,357,519 clicks from 29,327 different key phrases typed into Google. The ingenious software looked up a site’s position for a key phrase the moment it received a click from Google. Then the position, click, date and time of ranking among other information was registered into a database to allow for a statistician to graph the websites movement in the rankings, and the way this affected the number of people that would click through, adjusting for weekly and monthly variance. The results are bound to change the way this industry worth over $12 Billion Dollars a year will go about their online marketing campaigns. 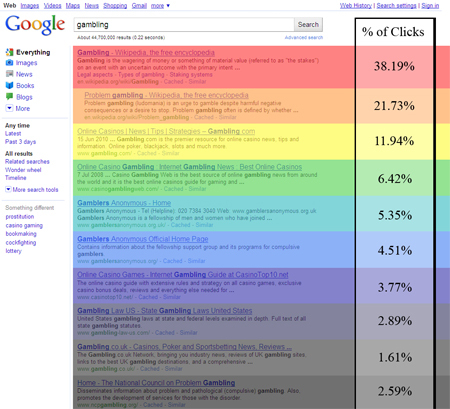 New Statistics on Distribution of Clicks on Search Engine Result PagesA new study conducted by BrandSoftech.com reveals new insights into the traffic distribution of the various positions on Google’s search engine result pages for the gambling industry.